Every fisherman knows of one spot that may lean a little to the prohibited side, in terms of public access. While most will brave “No Trespassing” signs, locked gates and high fences for a chance at fish that see almost no pressure during the season, take this article as a warning against intruding on such lands. Not only is it illegal, but trespassing can yield severe consequences when you’re caught—and eventually, everyone is caught. There are several reasons you should never trespass just to catch a few fish, the most obvious being that the land is private property and belongs to someone. The reasons behind a posted sign against intruders are not for fishermen to judge and adhere to as they see fit; after all, how would you like it if a stranger walked into your house without notice? Private lands are just that: private, and should be treated and respected as such. Often times, restrictions on natural areas stem from the fact that those areas are protected nature reserves or public parks, where an attempt to sustain rare plant and animal species in a natural ecosystem has been established. Fishing in these areas when advised otherwise could endanger and disrupt the species found there and permanently ruin the delicate natural balance, possibly disrupting the future survival of key organisms. Please, enjoy these areas with your family, or take pictures with a camera while on a hike, but refrain from fishing waters in such places unless otherwise allowed to do so. 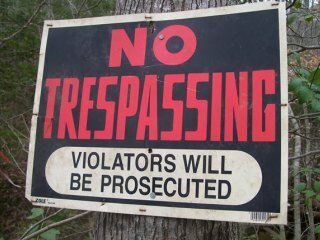 Another reason to exercise willpower and refrain from trespassing is arguably the most important one: land owners have been known to shoot trespassers on several occasions. When you post several signs prohibiting intruders from entering your land, you are permitted to expel those intruders with force should they insist on encroachment. Once again, a few fish aren’t worth the risk of personal injury or death. One last reason that every angler should remember when considering sneaking into prohibited lands to fish is simple: it sends a bad message about fishermen. Furthermore, it sets a bad example for other fishermen, especially young children. Each time the police are called to round up trespassing anglers, it looks bad on the fishing community as a whole, and, should incidents continue, it could result in permanent regulations on behalf of the Department of Natural Resources that further limit permitted fishing areas. The main reason we fish is to exhibit our love and respect for the outdoors and our passion for nature. Let’s maintain that mindset and do what we can to keep the trespassing, and consequential incidences, from continuing. There is plenty of public water in the world to be shared, so climbing a fence and sneaking onto someone’s property isn’t necessary at all. Be smart, be respectful, and most of all, be aware of where you’re fishing and don’t let the attraction of unpressured fish tempt you; the consequences can be more than you’re able to endure.